is devoted to spreading the word about the art and science of landscape horticulture primarily in the temperate zones of the world. We want to provide information that will help you on your journey to a more beautiful and healthy backyard. The number one selling perennial plant genus in recent years and a personal favorite of Mr PGC for many years is the Hosta! We offer the as a source of information on the selection, care and cultivation of hostas. 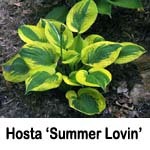 Our site includes images and/or information on over 8,000 hosta species and named cultivars. We include a database which has the hostas divided by categories such as type of variegation, size, flower color, etc. We have now published several in what we anticipate will be a long series of our "A Rookie's Guide to..." . These publications are aimed at the beginning to serious hobbyist gardener. Our very large collection of thousands of ornamental is now included in our site. Galleries are organized by plant genus and includes many, many species and named cultivars. We are adding new images all the time. Take a look. If you need to use our images for publications, name tags, literature or websites, please let us know. Mr PGC has been fortunate to be able to visit public and private gardens in 11 countries and 22 states over the past several decades. Our section currently contains pictures and commentary on around 225 horticultural locales so far. In our pages, we have compiled information on thousands of ornamental plant families, genera, species and named cultivars. All of the references are cross-linked to show the relationships between the plants listed along with cultural information. Links to relevant image galleries are also provided so you can see how the plants might look in your garden. Ever wonder where plants get their names? Well some of them are named for the people who "discovered" them. Our section tells about historical and contemporary people of note in the gardening and horticultural world. Since hostas are one of our specialties, we have added a section to tell you about the people who have been the leaders in developing and popularizing this genus of landscape plants. Our section deals with all the things you need to know in order to plant, prune, fertilize, support and otherwise take care of your ornamental landscape plants. We also cover the basics of insects, diseases and cultural problems and approaches for managing them in the home ornamental garden. Our contains tons of useful links to public gardens, arboreta and conservatories as well as to thousands of plant societies and clubs. There is also information from land grant and other universities as well as non-profit, gardening related organizations. Water in the landscape adds a new dimension to its beauty and tranquility. In our unit, we follow the process of developing your own pond. It includes information on how to design, construct and maintain a pond or pool including how to deal with water plants, fish and surrounding landscaping. If it is part of the garden but isn't currently alive, it is called hardscape. pages include information about paths, statuary, fountains, benches, structures and much more. Each piece of hardscape becomes an important element of the design of your garden. Enter your keyword(s) below to search the content of PlantsGalore.Com.